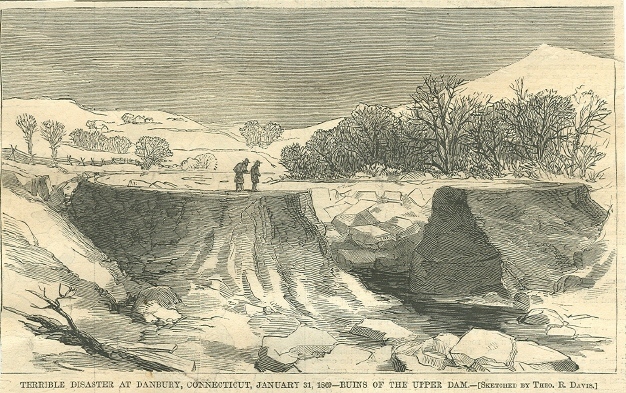 On January 31, 1869, Danbury’s Kohanza Reservoir froze. At around 7 o’clock in the evening the icy surface broke, causing the upper Kohanza dam to burst, which in turn caused a flood surge on the lower dam. With both dams destroyed, the water once contained in the reservoirs flowed quickly and forcefully into Danbury. By 1860 Danbury’s thriving hat industry employed almost 2,000 hatters in 12 factories. In order to turn animal pelts into felt, hat makers needed abundant amounts of water. To satisfy this demand the town built numerous dams and reservoirs, the first of which was the lower dam of the Kohanza Reservoir constructed in 1860. The earthen dam was 336 feet long and 27 feet wide, held 40 million gallons of water, and was located three miles from the town. To get the water supply into the town, residents built water lines from wrought iron, wood, and cement. By 1865, residents built the upper dam. On the evening the dams broke, the force from the two reservoirs was so great that it carried ice floes, rocks, and trees with it. This deluge swept away houses and buildings and destroyed three bridges in a matter of minutes. Most tragically, the flash flood took the lives of 11 Danbury residents. Portions of both reservoirs still serve the residents of Danbury and are known as Upper Kohanza Lake and Lower Kohanza Lake. While other natural disasters, such as floods and hurricanes, have threatened the area throughout the centuries, the 1869 deluge remains the town’s single worst disaster.